Elk, beef, duck, bison, lamb and turkey are just some of the proteins used in burgers at Bareburger. The microchain makes sure their burgers are more than just meat-based, and keep vegetarians and vegans in mind with offerings that already include the Farmstead, made from sweet potatoes and wild rice, and the Guadalupe, a black bean and roasted corn burger. Recently, Bareburger has slowly started to roll out another all-natural vegan burger that supposedly tastes close to, or like beef. 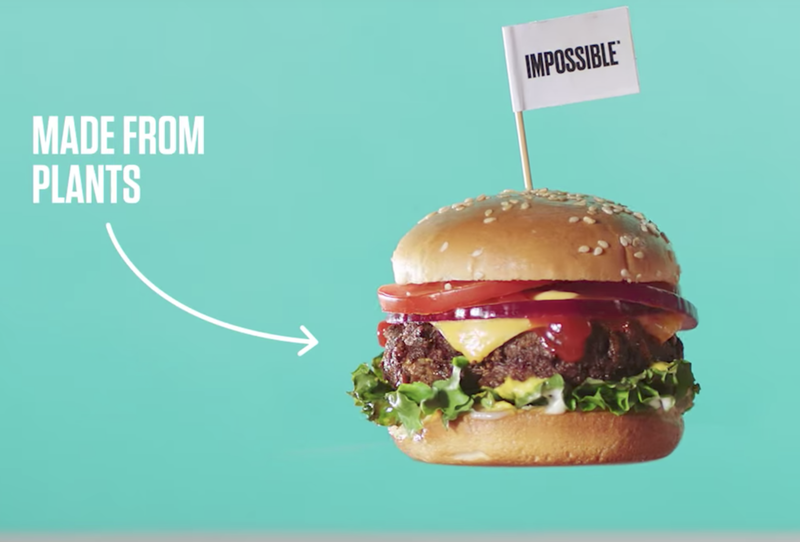 Created by Impossible Foods and CEO/founder/scientist Pat Brown, and appropriately named The Impossible Burger, this meatless option is solely made from plants. It’s made up of wheat and potato proteins for a familiar beef burger-like texture, vitamins, amino acids, sugars, and uses konjac (from Japanese yams) and xanthan (made by fermentation) as binders for the patty. It also uses a molecule called heme, which carries oxygen in our blood. Heme is in every living thing, plants included, and makes our blood red. Since red meat contains large amounts of heme, The Impossible Burger uses heme made from fermentation, and gives it a meatier taste than most vegan or veggie burgers on the market. It uses two fats, coconut oil and soybeans to give it that much needed sizzle effect when it hits the grill. At Bareburger, The Impossible Burger ($14.95) comes dressed with melted American cheese (without if you’re sticking to the vegan thing), dill pickles, gem lettuce, special burger sauce, and sweet caramelized onions cooked down in stout beer, all on a brioche bun (you can switch it to a gluten-free or sprout bun, or a collard green wrap). You do have the option to build-your-own, so pile it high with toppings if you wish. I’m far from being a vegetarian, and even further from being vegan, but this wasn’t bad at all! It had the crusty sear that a beef burger should have, a chopped steak consistency when I took a bite, it was well-seasoned with Bareburger’s burger rub, and it had that juicy, burger drip action that most veggie patties lack. I may never be a full-blown meatless burger guy, but this was easily one of the better vegetable-based burgers I’ve had in a while. If you’re intrigued by The Impossible Burger, it’s available at both Connecticut Bareburger restaurants in Ridgefield and Stamford, and in New York. In the coming months, it will be added to Bareburger’s menus in other states and overseas.